Antonia Kesel – violin, Cecilia Bignall – cello, Joseph Havlat – piano. These musicians visited Rhyl recently (in the guise of the Jørgensen Trio) and they have been rebooked by popular demand. They are a vibrant, London-based piano trio. Founded in 2012, Antonia and Cecilia have recently welcomed Joseph Havlat into the group. All three studied at the Royal Academy of Music where the trio held the CAVATINA Chamber Music Fellowship in 2015-2016, with Jack Liebeck, Robert Cohen and Joanna MacGregor respectively. The trio was the first ensemble to win both the audience prize and first prize at St Martin’s Chamber Music Competition, as well as first prize at the Malta International Music Competition, in 2015. They have performed extensively across the UK and Europe, including at St John’s Smith Square, St Martin-in-the-Fields, Oslo Opera House, Dartington, and the National Gallery. 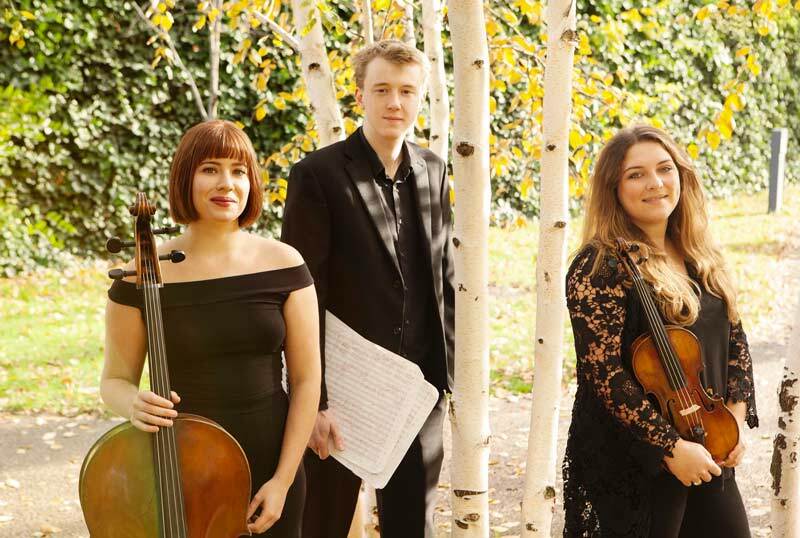 They have played for Menahem Pressler, Trio Owon, Levon Chillingirian, Ian Brown and Kathryn Stott among others, and have attended masterclasses at the Aurora Festival in Sweden and at IMS Prussia Cove, where they studied with Thomas Ades. The trio are keen to explore a wide range of repertoire, including new works and commissions, and collaborations with other ensembles and genres of music. Previous collaborations have included projects with Ensemble Mirage and jazz sextet ‘Mosaic’, and most recently with composer Cecilia McDowall, recording a CD of her chamber works (to be released soon on Deux-Elles).